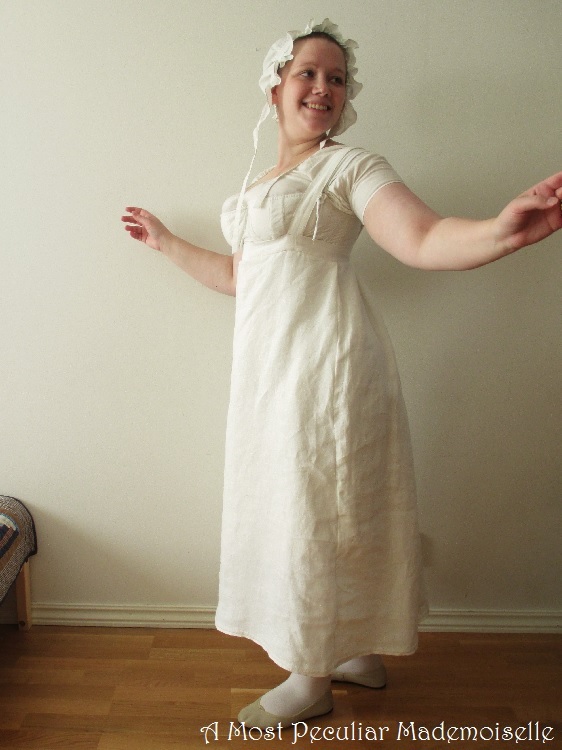 I’ve been meaning to make an early 19th century petticoat for some time, and now I finally have! 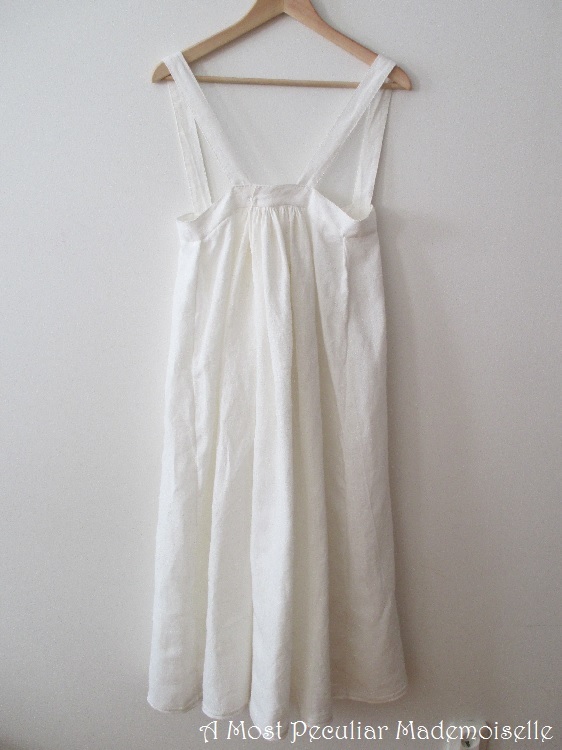 It’s a plain, unadorned petticoat held up with shoulder straps, simple but serviceable. 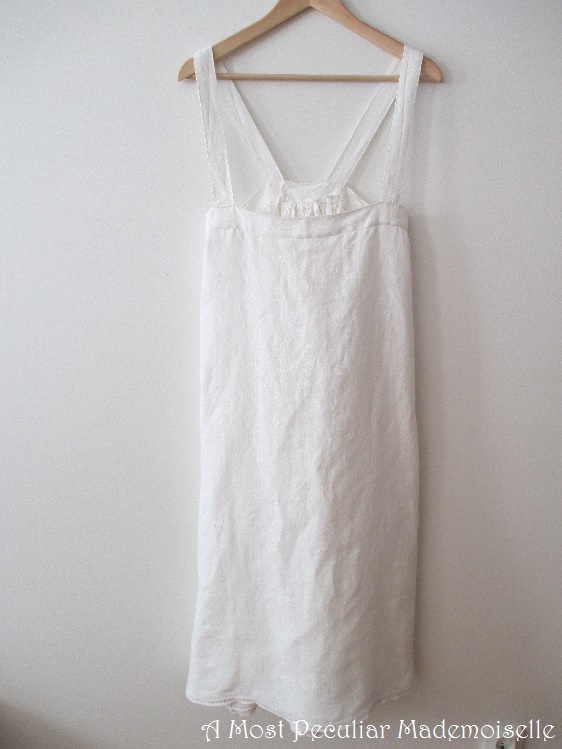 I mean to primarily wear it with my heavily pieced lower class dress. as my heavy upper arms are a sore spot with me. Be kind. 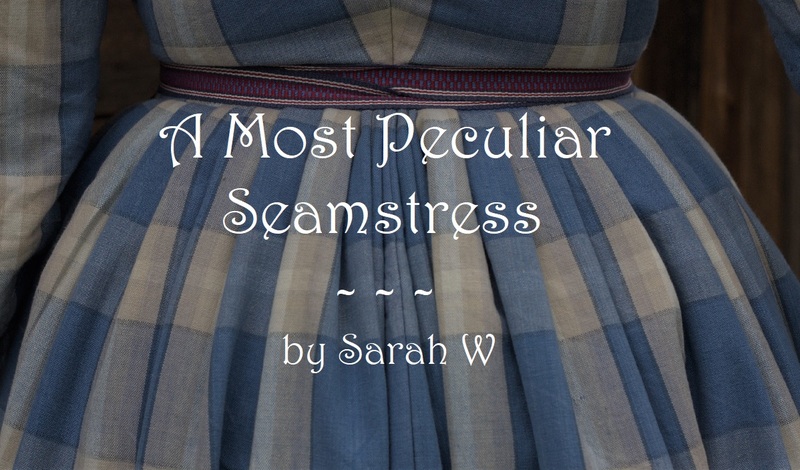 The petticoat is made from bleached linen, a bit on the coarse side, and a bit too loosely woven to be perfectly period, but it’s what I had in my stash. I didn’t have very much of it, so the petticoat ended up slightly shorter than I’d have wished, but still within what’s acceptable for the period, and it does the job. I made it with the measure and cut method, as it’s so simple it doesn’t require an actual pattern. 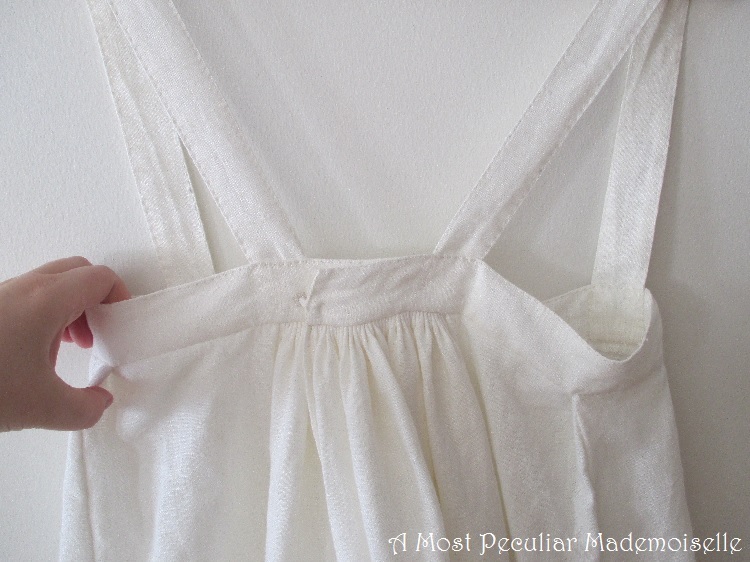 The front is cut as a shaped panel to fit the raised waist from side to side and widens towards the hem. The back is cut in two straight panels with a seam down the back. It would have been more period to have the back cut in one, with a slit cut in the fabric for the back opening, but I had to piece the back to make it wide enough. I used the books Kvinnligt Mode Under Två Sekel by Britta Hammar and Pernilla Rasmussen and Skräddaren, Sömmerskan och Modet by Pernilla Rasmussen to decide what stitches to use, as they describe several Swedish extant garments and seam methods in great detail. The skirt is stitched together with running stitches and a back stitch every inch or so. 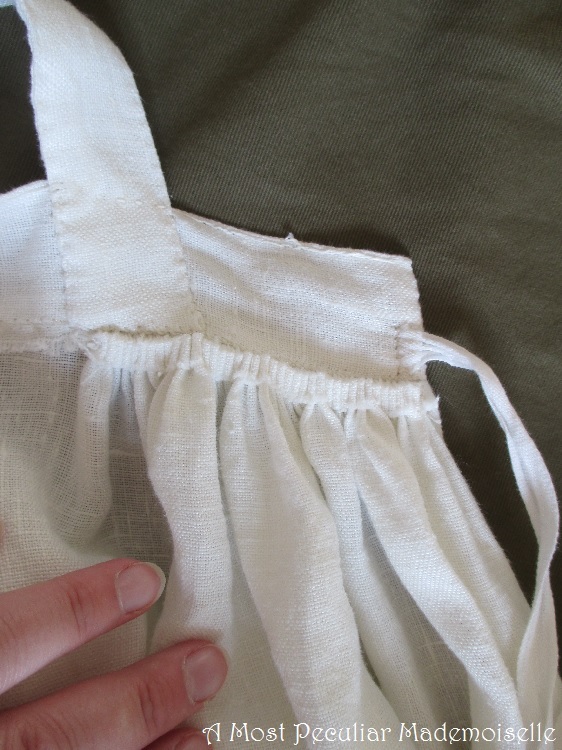 The seam allowances are folded over and stitched to the joining seam, as seen in several extant dresses in these books. As I didn’t want to lose any more skirt length than necessary, I decided to use the selvedge of the fabric for this. The selvedge sticks out a little bit, compensating for the narrow hem I had to fold back, and hemstitched to it. 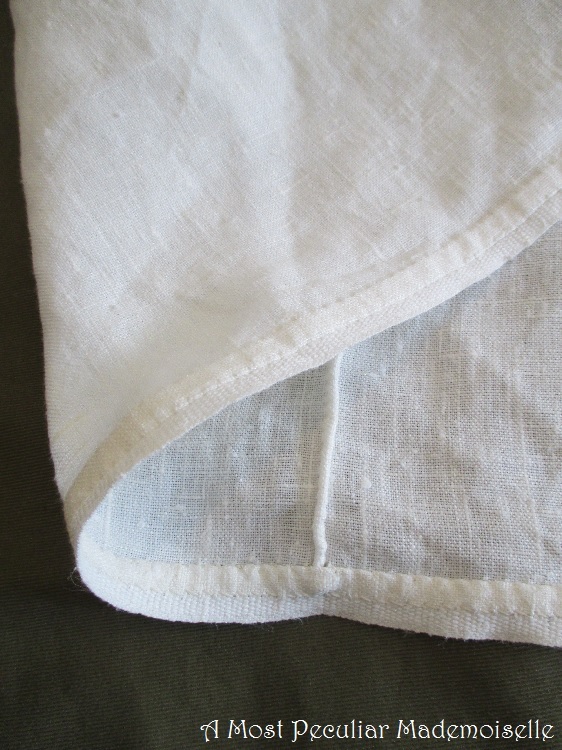 The selvedge is then folded down on the inside and hemstitched in place. It gives a very neat look, almost like a woven tape being used. There are examples of cut off selvedges being used to hem skirts among the lower sorts on the Swedish countryside though, so it’s not completely taken from my own head. I folded the upper part of the skirt down about a centimetre, and made two rows of gathering stitches in the back. I then pinned the skirt to a waistband (a straight piece of linen folded in half), putting a pleat in each side to give room for the hips, and drawing up the gathering threads to make shallow cartridge pleats. Skirt and waistband where then whip stitched together. I finished the waistband with running stitches along the upper edge. The waistband is almost on the wide side, but that was a conscious choice to add that extra little bit of length. For shoulder straps I cut two straight pieces of linen, folded them in half and sewed a row of running stitches along each side. I pinned them in place, tried the petticoat over the proper underpinnings, and adjusted them until I was happy with the fit. After taking it off, I made sure both sides matched, and stitched the shoulder straps to the inside of the waistband. For closure I decided on ties. I had cotton tape at home, so that is what I used. Silly enough, the waistband turned out too large (the result of me being lazy and not putting on the stays before measuring for it), and I didn’t feel like unpicking it, so I made an eyelet for one of the ties to go through, and I can let the ties wrap around to tie in front instead, making the petticoat adjustable in size. A dress in Costume in Detail by Nancy Bradfield has that feature, so I decided it was acceptable. In the pictures I have tied the tapes under the petticoat, but if I put the tape through the eyelet from the inside and out I could tie the tapes on the outside instead. 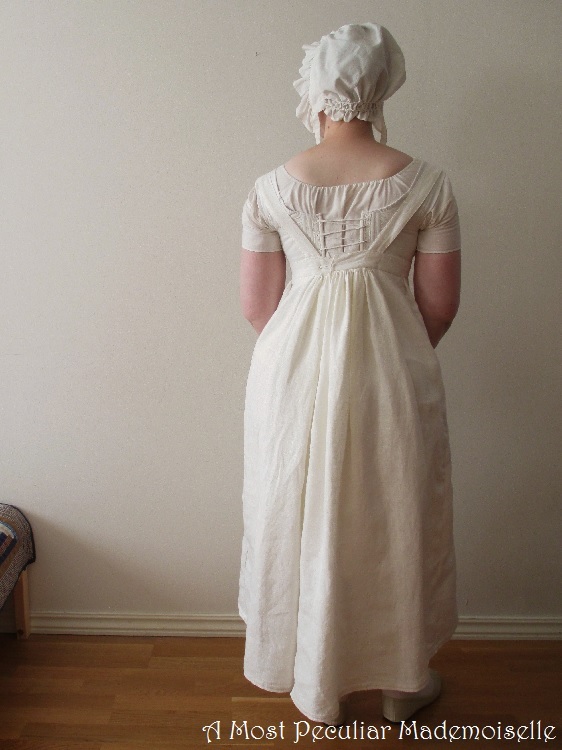 I’m wearing the petticoat over a linen shift and 1810’s style stays. So, while it’s no fancy sewing, at least it’s historical. I’m back, people! 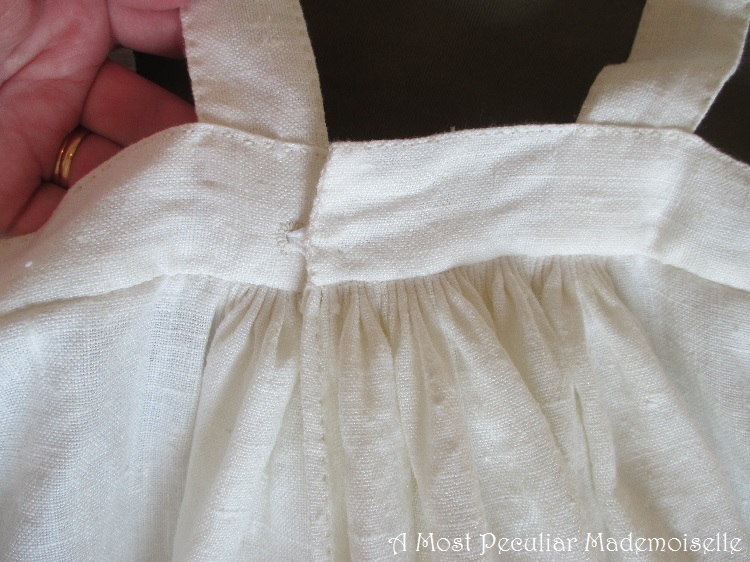 This is a beautiful petticoat and I too appreciate all the close up details of how you constructed it. Lovely work, as always! I like the shoulder strap arrangement to keep it up. Thanks 🙂 I was wondering how shoulder straps would work on my figure, but it worked nicely. Remains to be seen how it works when worn over a longer period of time. I have to cross my straps at the back, otherwise they slip off my shoulders.